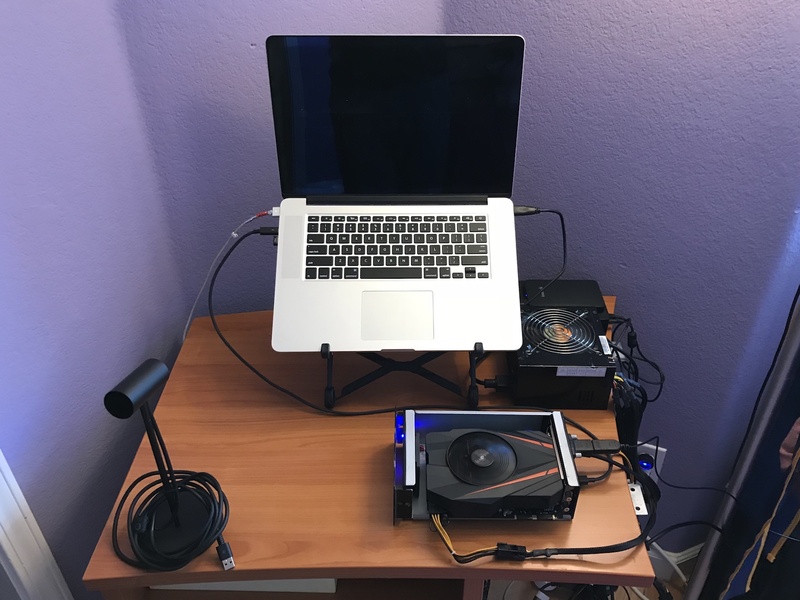 I'm mainly interested in building eGPUs that require a minimum of nonsense: no scripts, no custom boot stuff, no hacks or resource management. I'm OK with running entirely in Bootcamp and over an external monitor. Fortunately, my particular model of Macbook seems to be especially well-suited to this task. I succeeded last time with my GTX 1050 Ti SC build, and everything seems to work just as well with this GTX 1080 upgrade. I already had Bootcamp, Windows 10, and the requisite Nvidia drivers installed from my previous 1050 Ti setup. The Gigabyte 1080 Mini is too tall for the AKiTiO case, but happens to be exactly the right length. (You don't even have to take the fan out.) I'm running with the top off at the moment, but I'm considering 3D printing a new top case at some point in the future. To power the case, I needed to assemble a really simple 4-pin ATX to 5.5x2.5mm barrel plug adaptor. 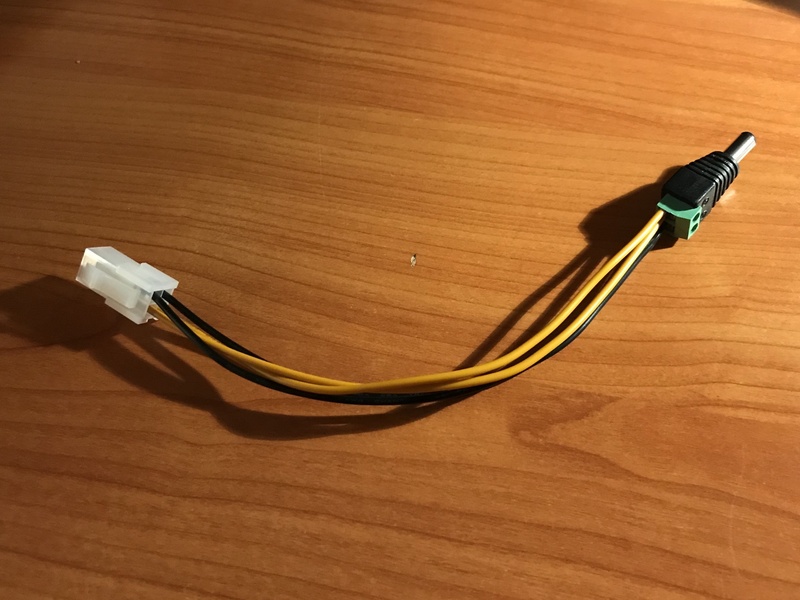 To power the card, I needed to get a 6-pin to 8-pin PCIe adaptor, since my PSU was too old. 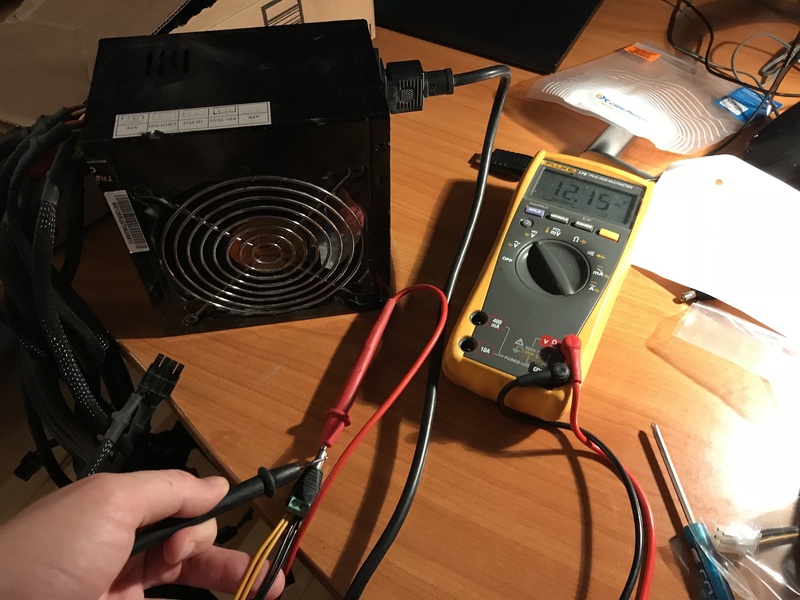 To turn on the PSU, I needed to add a jumper to the 24-pin ATX plug. I had some trouble using the top TB2 port on the Thunder2, but after switching ports everything started working perfectly. No error 12, no EFI hacks, nothing extra required. The only caveat is that it sometimes takes a few tries to hear the chime at startup. As expected, I'm getting 2.5–3.0x the performance of my previous 1050 Ti, along with a 20% TB2 performance penalty. Note that these are only the graphics scores, not the total scores (since my CPU is irrelevant). Aside from the PSU and top case hassles, I'm really loving this setup. At last, Far Cry 4 runs at 60fps on Ultra at full 1920x1080 resolution, and I can play VR games without a hitch! 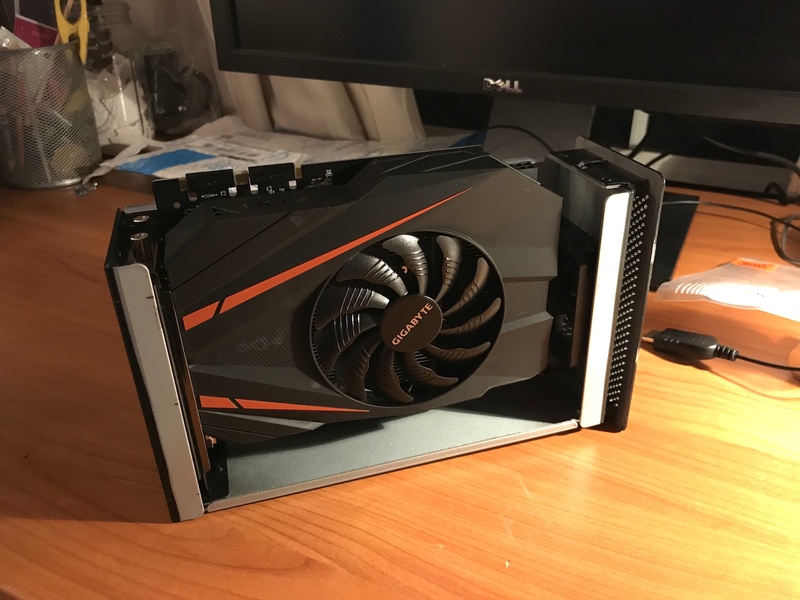 Purchasing the Gigabyte Aorus GTX 1080 Gaming Box (which sports the same GPU, integrated power, TB3 + USB ports, and an almost-identical form factor) would have been more sensible if I had a different Macbook, but apparently, the TB3 to TB2 bridge won't work with Nvidia cards when your Mac has an integrated Nvidia GPU. 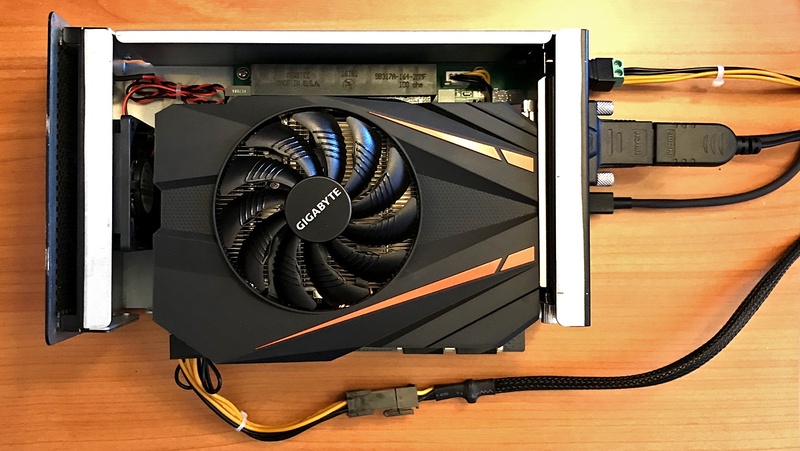 the TB3 to TB2 bridge won't work with Nvidia cards when your Mac has an integrated Nvidia GPU. 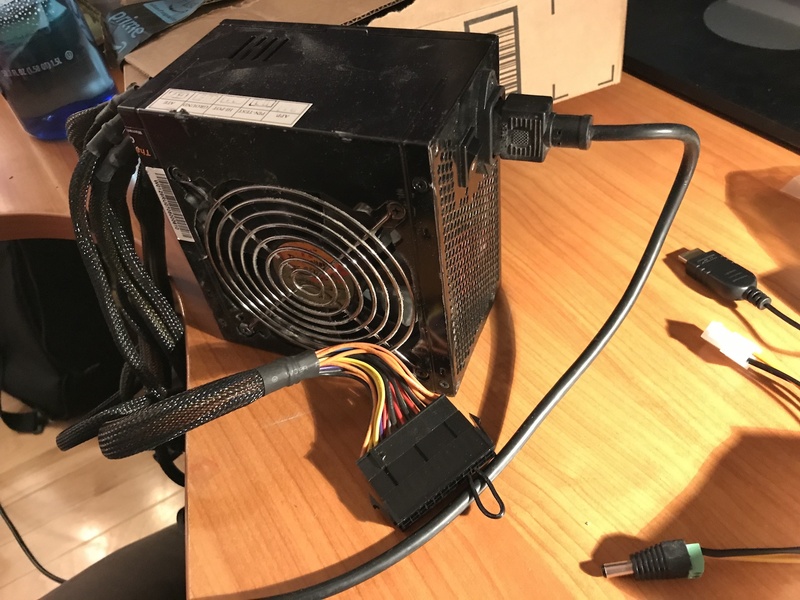 Will it work with an AMD card? I would like the smalles possible enclosure and Akitio TB2/TB3 and Lite are on my list. My MBPr has integrated GPU (2012 model).